I have never been much of a portrait photographer. In fact, I am a bit intimidated by it and don’t really enjoy doing portraits. But I also think it is a good idea to push beyond your comfort zone in order to broaden your overall photography skills. Even if you never intend to make a living with a particular type of photography and even if it scares you. So I have tried my hand at portraits now and then. But self-portraits are a whole other ball game. I am behind the camera because that is where I am most comfortable. I will go so far as to say that I hate being in front of the camera. However, in the spirit of becoming a better photographer it is a good idea to put yourself in the shoes of your subjects. Knowing how hard it can be for those of us that are not naturals in front of a camera by first hand experience can only help you work with subjects better and make them more comfortable and natural when being photographed. For that reason, and because it was an assignment in a commercial photography class I am taking, I put myself in front of the camera and took a shot at self-portraits. Let me tell you, this was not easy. Being both photographer and model is a difficult task. To begin with you have to compose and expose for a subject that is not there. Then you sit yourself and take a guess at where your head should be so that nothing is cropped off and click the shutter. Review the image and start again. I did figure that tethering the camera to the laptop and using the remote preview feature was very helpful. But this is still not easy. So I did not sell myself on becoming a portrait photographer much less a self-portrait enthusiast. But in the end I was satisfied with my results. The cropping in this image was intentional (not a result of not being sure where to place my head). 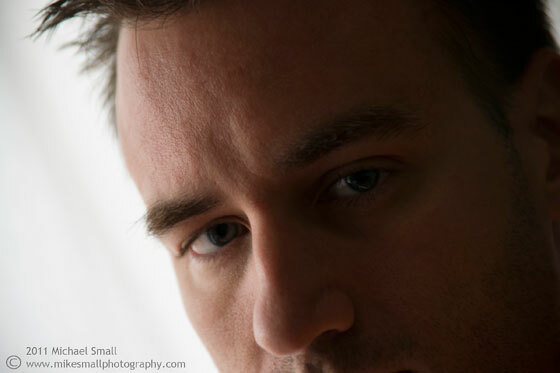 I was attempting something different with a very close up and tightly cropped image rather than showing my whole face. Also a bit more incognito this way.